My sister Sarah is a Tetris addict. Something about spinning those awkwardly shaped blocks around and packing them together must release happy chemicals in her brain. It’s serious: she played Tetris in her wedding gown right before walking down the aisle, and she thinks this guy is totally hot. I really can’t talk. I play real-life Tetris. All my errands have to be planned to ensure maximum efficiency: no driving out of my way or backtracking. My groceries are arranged on the checkout belt so that they fit together nicely. Periodically I’ll rearrange my fridge so that all the food is organized by shape (flat items on bottom, tall items shoved together in the back, and materials to make a quick dinner wrap all stacked together neatly for easy grabbing). But the fridge is nothing compared to the freezer. My roommate and I are world champions at Freezer Tetris. We both overshop, and every now and then one of us will come home with a month’s worth of foodstuffs to shove into our already-full freezer (cue the excuses: “It was on sale! It’s cheaper when you buy in bulk!”). Let the games begin! We set to work emptying, rearranging, tossing, organizing, repackaging, and creatively stuffing until every last green pea has its own chilly little space in the freezer. There ought to be an international competition we can enter or something — why let all this talent go to waste? I don’t know about other bakers, but the bulk of my freezer space is consumed by dessert scraps: leftover cake, extra frosting, the last piece of blueberry pie, curds, berries, ice creams, doughs. For someone who only eats dessert on the weekend, I have a lot of fixins! Well, my Freezer Tetris has served me well. This week I went out and bought some of my favorite ice cream flavors, grabbed out some of my scraps, and created Ice Cream Cupcakes. If you have sweet bits and pieces lying around your freezer, this is just the leftover makeover you need! The Coffee Cupcake decided it was too sophisticated to be photographed with the others. Love that beautiful stamped mug as much as I do? It’s made by local artist Julie Payne. She also makes lovely clay pendants. This post is actually more of a method than a recipe (as such, you’ll find detailed process photos below). You can use any ice creams, cakes, brownies, cookies, or creative add-ins that suit your fancy. 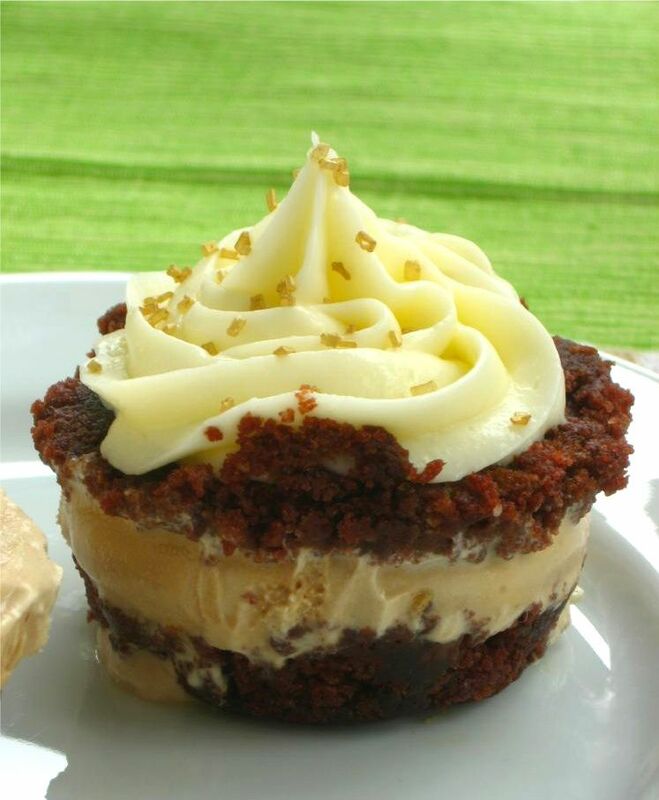 The overall idea is to create a personal ice cream cupcake with three layers (two cake layers sandwiching a thick slab of ice cream), freezing the layers as you build. The whole thing is topped with icing and decorated before being stuck back in the freezer. Clockwise from top: Cake Batter Ice Cream Cupcake, Cherry Garcia FroYo Cupcake, and Pistachio Ice Cream Cupcake. Personally, I had some leftover chocolate sheet cake (the best cake in the world, and so easy!) and cream cheese frosting. I made four variations: Cake Batter Ice Cream Cupcakes (with and without toffee pieces added), Pistachio Ice Cream Cupcakes, Cherry Garcia FroYo Cupcakes, and Coffee Ice Cream Cupcakes (with and without Ferrero Rocher or toffee pieces added). I can’t decide which was my favorite! 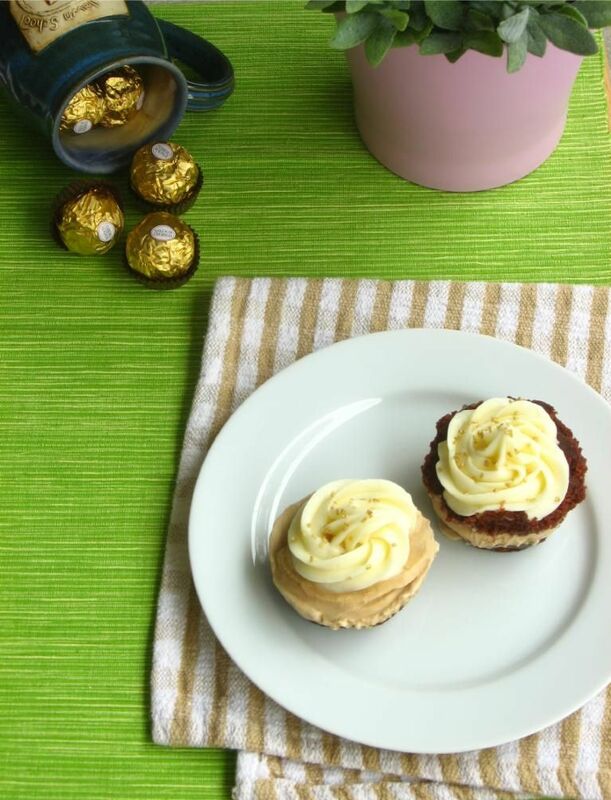 The deep coffee flavor complemented the chocolate cake and Ferrero Rocher perfectly, creating a rich, indulgent cupcake. The cake batter cupcake tasted just like a big ice cream birthday cake. I think if forced to choose, though . . . I might have to go with the pistachio! Something about the sweet, otherworldly flavor of pistachio ice cream with toasted pistachios and chocolate cake just bowled me over. Speaking of bowls, that’s how we ate these: in a bowl with a spoon. No sticky fingers! Shall we call this a Café au Lait Cupcake? Grab a couple of pints of ice cream, some leftovers, and go wild! 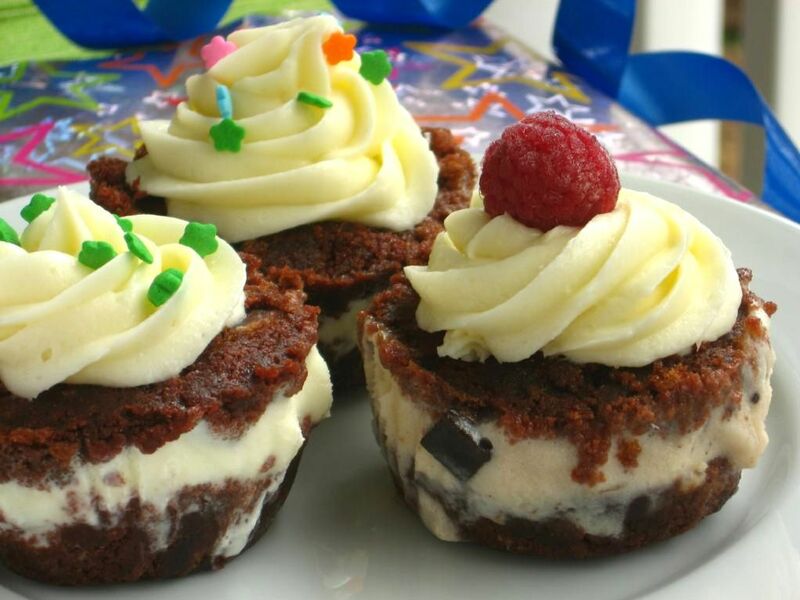 You could even whip up a small cake or some brownies just for the purpose of tearing it up and making some ice cream cupcakes! I won’t tell. 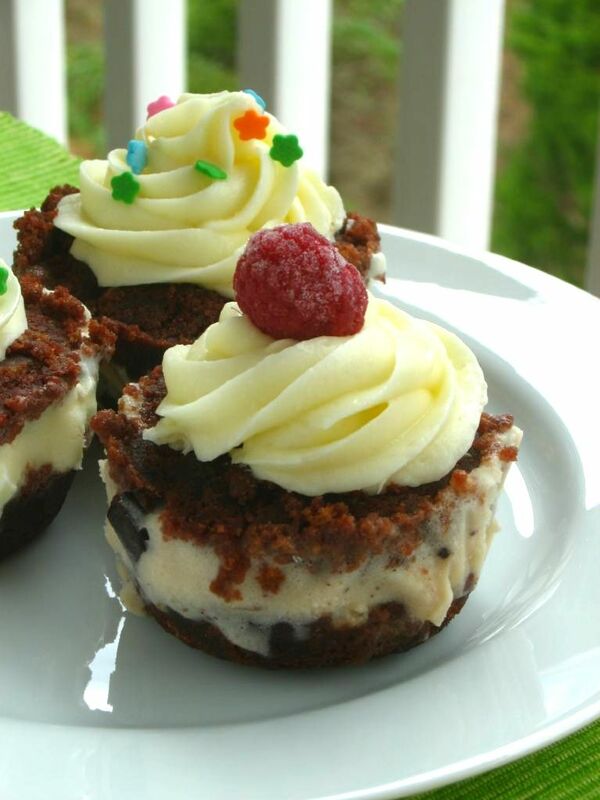 What ice cream flavor would you pick for your cupcakes? 1. Clean out some space in your freezer. You’ll need room for the muffin tins in addition to the container you’ll eventually store your cupcakes in. You don’t want to have to clear out space in the middle of the process while your cupcakes melt on the counter! Don’t ask me how I know this. 2. Line your muffin tins with plastic wrap, leaving an overhang. I did this by cutting a long sheet of plastic wrap in half lengthwise. I then used each long, thin strip to line one column of wells on my muffin tin — using 3 strips total. 3. Form the base cake layer: Place a heaping scoop of cake or brownie into each well. Lay a small square of wax paper over the wells one at a time, pressing on the cake with the bottom of the glass to flatten and pack it. Carefully peel wax paper away and continue until all wells have a base cake layer. You also might be able to put wax paper over all of the wells, press down with the bottom of another muffin pan, and pack cake into all the wells at once — but I didn’t try this. 4. Form the ice cream layer: Scoop a heaping spoonful of ice cream over the packed cake and level it with the back of a spoon. Sprinkle any add-ins over the ice cream layer. Try to leave some room at the top of the well for another cake layer! 5. 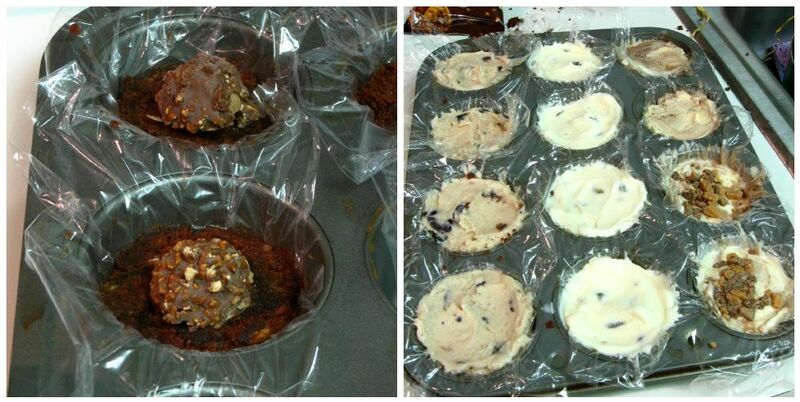 Cover muffin tin with plastic wrap and freeze for a few hours. 6. Form final cake layer: Working quickly, scoop a final spoonful of cake over each well. Lay a small square of wax paper over the wells one at a time, pressing on the cake with the bottom of the glass to flatten and pack it. Carefully peel wax paper away and use a table knife to scrape away any uneven edges. Continue until all cupcakes have a top cake layer. 7. 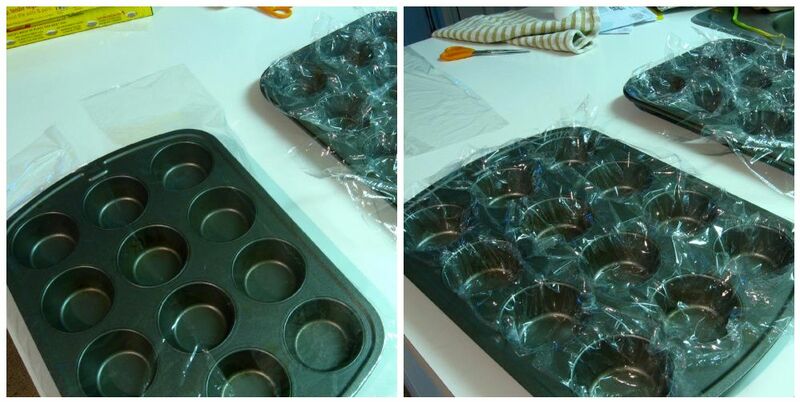 Cover muffin tin with plastic wrap and freeze for about an hour. 8. Frosting and decorating: Do this step in batches if possible! Things can get melty and messy if your cupcakes sit out too long waiting to be decorated. Don’t ask me how I know this. Pull 4 cupcakes out of your tin at a time using the plastic wrap overhang, keeping the rest of the cupcakes in the freezer. 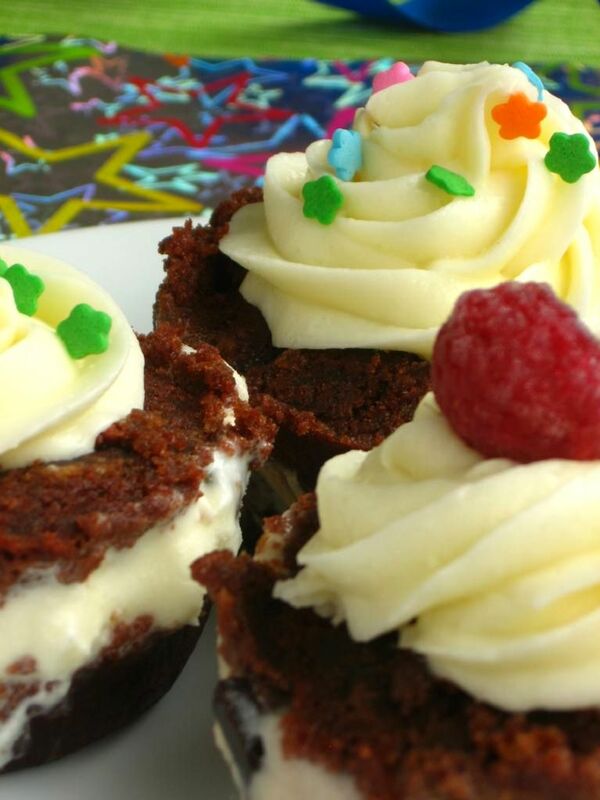 Place cupcakes carefully into cupcake papers if desired, or directly into storage container. Frost with a big star tip and decorate with sprinkles, nuts, or frozen berries as desired. 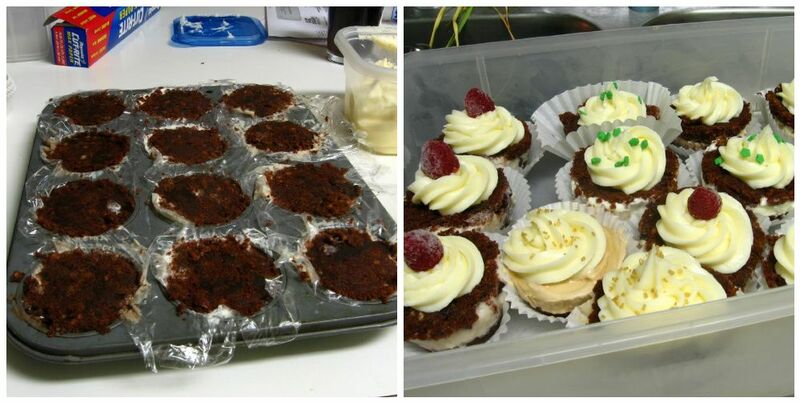 Place finished cupcakes into your storage container and then into then freezer while you move on to the next batch. 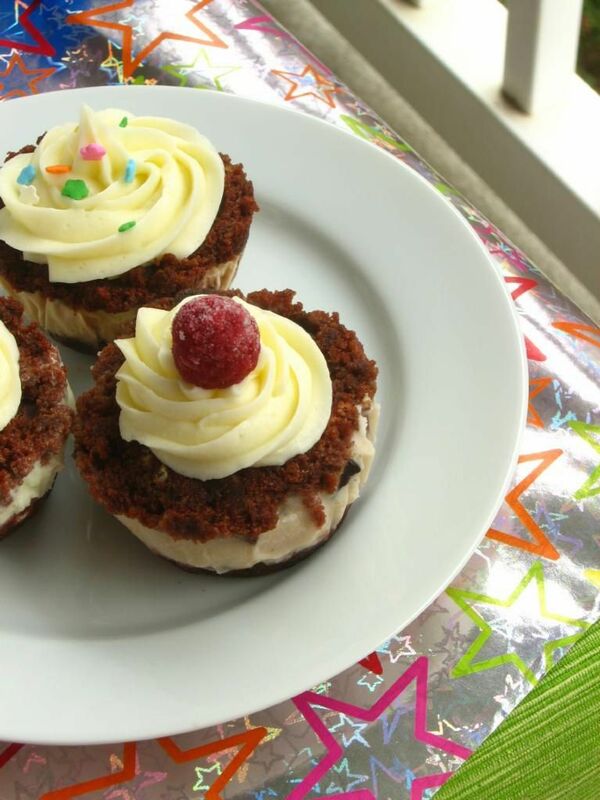 Keep cupcakes frozen until you’re ready to enjoy them (no need to soften before eating)! Step 2: Cut long strips of plastic wrap to line columns of wells in your muffin tin. 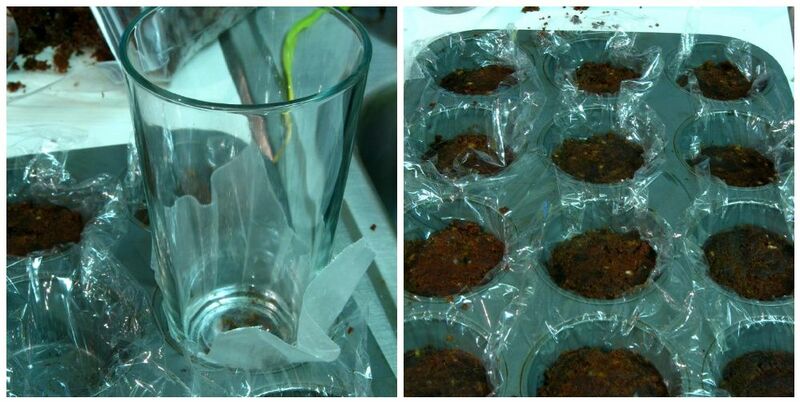 Step 3: Spoon cake into the well, cover with a square of wax paper, and use the base of a glass to pack and flatten. Step 4: This is a good time to add Ferrero Rocher halves! Add ice cream layer and freeze for a few hours. Step 6 and final cupcakes! Pack another layer of cake on, cover and freeze, and then decorate! Lovely, perfect, beautiful, lookin’ delicious. 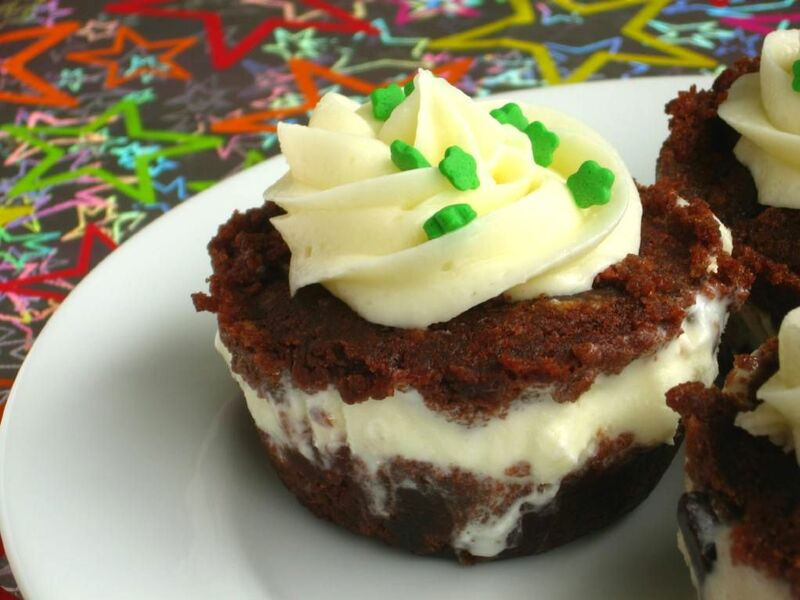 These cupcakes are the work of a genius foodie blogger. Thank you for labelling my foodie habits. Freezer tetris. I can’t wait to spring this term on my partner. He’ll laugh all day. My freezer is just like that! I have a scrap of chocolate cake, brownies, peanut butter brownies, random pie and cookie doughs, etc. This is an awesome idea! My boyfriend would love the pistachio one too… I think mine would have to be some sort of chocolate raspberry concoction! What an absolutely fabulous idea! I love it! Great for a kid’s birthday party too! I am “tetris organized” :), but unfortunately my husband is not:( Arggggh!!! That’s quite a lot of stuff to keep organised…. my mom’s really good at it….. all i do is potter around in the kitchen n leave the organizing to her….. These look great and I am sure taste great and that is what counts. Wow – what a great idea for cupcakes! Also that chocolate cake looks so yummy too! This is such a brilliant idea and they look fantastic! I loved them so much that I am including them and links to your site as part of our five strange cupcake idea post on http://www.partycupcakeideas.com on Wednesday 14th July. Hi I love this recipe!! I’m going to do this for my daughters birthday was just wondering if the cake needs to be frozen before used here? Hi Janice! I hope she loves them! The cake doesn’t need to be frozen, but should be completely cooled before you crumble it and pack it in 🙂 Enjoy! What a tasty sandwiches of cupcakes and ice cream , it sound awesome. I’ve featured this recipe on my blog, hoping that you don’t mind, but if you do, please contact me and I’ll remove it. All the best.